Community Solar Archives - Page 6 of 7 - Solar Love! VoteSolar has produced a tip sheet on principles for distributed solar generation policies and rates. On the surface of it, this type of information might not seem all that appealing to the average consumer, but it is actually quite important because distributed solar allows consumers more freedom of choice. Freedom of choice generally gets consumer attention, because consumers like flexibility. Historically, utility companies have had something of a monopoly on electricity and gas, so consumers did not have much flexibility. However, because of the dramatic decrease in the cost of solar power, rooftop and other distributed solar types are set to increase. Most consumers may not want to abandon the utility-backed grid systems. At the same time, distributed solar power generation is attractive because it can provide electricity at lower rates. Community solar parks, for example, have been constructed and used in some states, like Colorado. You can tell we are all in a transitional phase in terms of where energy is coming from. Vote Solar wants to make sure consumer awareness is high and that consumers are able to access power at affordable rates. Let’s look at its six principles. 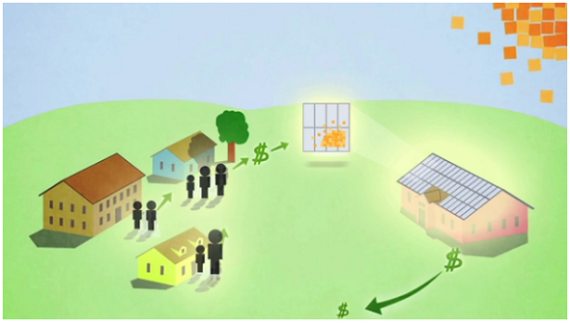 Each customer can choose the amount of energy to purchase from the grid, the amount to self-produce and consume, and the amount to save through efficiency measures that reduce consumption. The self production might be the most important point. In the very near future, homeowners and business people are likely to be producing more of their own energy. No utility or other entity should be allowed to place limits on how much energy can be produced. Placing such limits would be sort of like blocking individuals from growing unlimited amounts of food in their own gardens. Customer-sited solar generation offers many benefits to the electric utility system and, by extension, to non-solar customers. These values and benefits should be quantified, and solar customers should be adequately compensated for the value their solar energy is delivering to all customers. Once customers are generating their own power, the power they can share should not be undervalued. In other words, their power should be sold at a rate that is fair to them. Tariffs and policies should not inhibit the deployment of DSG, demand response, combined heat and power (e.g. fuel cells), storage or other innovative energy technologies that are currently available or will be available in the forseeable future. This point is also about consumer fairness. Consumers don’t make high-level policies but are still impacted by them. Utilities might have an incentive to block the growth of energy production that can’t control or manage. They also have the ability to influence public policy in their own favor. Utility rates should treat reductions in utility revenues due to net metered solar and other DSG in a manner that is fully comparable to reductions due to other consumer behaviors including energy efficiency and demand response. Any rate treatment that is not generally applied to all similarly situated customers must be cost-justified and seek to avoid unintended consequences. This one is a more detailed extension of the previous one about fairness to consumers. currently, solar power generation is an emerging trend, so it must be protected in order to expand further. A transparent and data-driven analysis, which allows stakeholder participation and ensures protection of due process rights, should be followed in order to optimize the chances for an outcome that is best for customers. Because the trend is an emerging one, it isn’t completely clear what all the legal aspects will turn out to be. So, customer rights to fairness in legal proceedings must be ensured as well. Within resource and grid planning processes, regulators should ensure that utilities effectively realize the present and future benefits that distributed solar provides, including freeing up distribution and transmission capacity and reducing the need for infrastructure upgrades. These cost savings must be shared equally among all customers, including low-income customers, through thoughtful rate design. Low-income customers can benefit the most from a decrease in energy bills, because they pay a disproportionate amount of their income for energy. 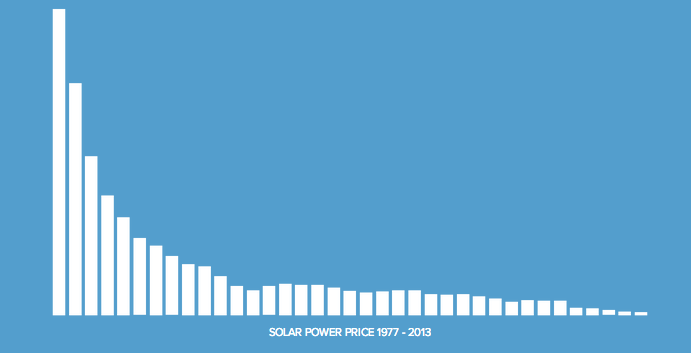 Solar power is going through a major transition now due to much lower costs. Because attention has been focused on the greater affordability, perhaps there has been less emphasis on the fact that solar technology continues to advance. IBM and Airlight Energy have partnered to create a solar sunflower for sale in 2017. It can generate 12 kilowatts of electricity and 20 kilowatts of heat daily when there is steady sunshine. If the average home rooftop solar system is about 5 kilowatts, the sunflower solar system could generate enough electricity for about 2.5 homes or a little more depending on consumption rates. The sunflower is a ten-meter high parabolic dish containing 36 mirrors, and within each mirror there are photovoltaic chips that generate electricity. Each chip is one square centimeter. They are similar to ones used on satellites for generating power. A water cooling system is used to cool the chips and maintain a temperature of about 180 degrees Fahrenheit. Without the water cooling system, chip temperatures could well exceed 2,000 degrees Fahrenheit. While such a unique design and complex technology sounds expensive, it has been estimated that with high volume production, that the total cost of a solar sunflower could be two or three times less than current options available. Another potential advantage is that the basic structure for the sunflower would be made of concrete so it could last for sixty years. The plastic mirrors will last about 10-15 years and would need to be replaced after that. The photovoltaic chips are expected to last 25 years which is in the about the same range of durability for typical solar panels. “With the HCPVT we are ushering in a new generation of solar energy technology. Not only is the system affordable, but it will create jobs where it is installed because many of the materials will be sourced locally. We expect to partner with firms around the world to bring a commercial version to market by 2017,” explained Dr. Gianluca Ambrosetti, Head of Research at Airlight Energy. The solar sunflower can also be customized for environments near sea water to convert salt water to fresh water, to the tune of hundreds of liters per day. Using a multi-dish sunflower array, water for a whole town could be desalinated. Less electricity is produced by a sunflower system that is also a mini-desalinization plant. As we see with this solar sunflower system idea and design, solar power is not just rooftop solar and it isn’t limited to only producing electricity. With further research and development it might take a number of creative and more potent forms. One of the great things about this concept is that it could more affordable than current systems. With improving solar power storage systems, we might see something of an energy revolution coming somewhat soon. The UN climate talks were held last week in New York City, and Conergy announced during the event a one-of-a-kind solar power plant that it was building in the French overseas territory of New Caledonia. The style and shape of the solar power plant is that of a heart. The warm, eye-catching, heart-shaped solar power plant is to be located 750 miles east of the Australian Gold Coast. It will be visible as a heart by air. This “Heart of New Caledonia” will be in the northern community of Pouembour, on Grand Terr, New Caledonia’s largest island. The plant will be on a four-hectare site. Up to 750 homes will have electricity generated from the 7,888 panels. The 2 MW project was commissioned by TIEA Energie, a subsidiary of local beverage company Froico SA. According to Solar Power World, the engineering and construction (EPC) work will start in the coming months, with Conergy partnering with local contractor AMBI Energy. The heart-shaped solar plant will save our planet an estimated two million tons of carbon dioxide emissions over its projected 25-year lifetime. Compare this to power from oil, gas, and coal, which generate the majority of the islands’ power today, and one finds this solar heart brings hope for cleaner air. The unique design is said to be inspired by the Coeur de Voh. Coeur de Voh or Heart of Voh is a naturally heart-shaped area of nearby wild mangrove vegetation.